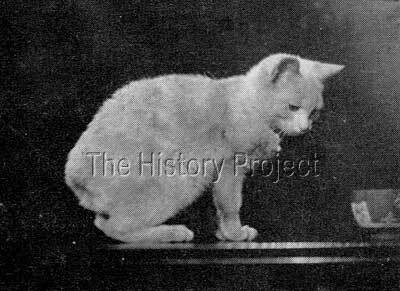 The history of individual Manx cats is often difficult to ascertain at best. This is mainly due to a great deal of incomplete information. In some cases we have names (which change), sometimes with parentage and sometimes without if they are foundation cats, some with registration numbers, some without, and some with dates of birth and some without. Cats often change hands and then their names can change at the same time, so all this adds to the complexity of tracking where they originated and where they ended up. Progeny and show results help to narrow the range and assist us to anchor them into a timeslot and often into ownership. 'Ch. Ramtal's Snowey Manx' falls into all these categories1. But that she was a reliable brood queen, who contributed to the Manx gene pool cannot be disputed as she can be found on the pedigrees of many Manx cats extant to this very day. From advertising records, we know that 'Ch. Ramtal's Snowey Manx' was formerly known as 'Ch. 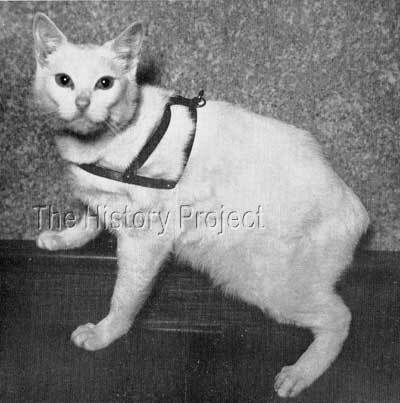 Snow Flake' and database records indicate that she was at one time owned by Mrs. Stephen L. Stillman of Pelham Manor, New York, (Ramtal Cattery). At this time, we can only presume that this was her original breeder, but as there are many registrations of Manx in the Foundation Register of cats belonging to Mrs. Stillman, a large number of those show that she obtained cats from other breeders around the country that were hitherto unregistered. So this cat, may well have been just another of these, named and shown as 'Snow Flake' and then duly registered by Mrs. Stillman as 'Ch. Ramtal's Snowey Manx'. Her date of birth is not given, but as we know the approximate age of her daughter 'Hanna's Rosamund' we can roughly estimate that she must have been born circa 1931-1932. 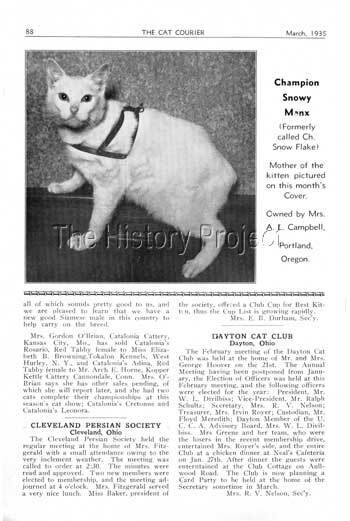 She is then included in advertising in The Cat Courier of March 1935, where she is clearly listed under the name of 'Ch. Snowy Manx' and as the dam of 'Hanna's Rosamund'. However, her owner at that time and the breeder of 'Hanna's Rosamund' is listed as Mrs. A.L. Campbell, of Portland, Oregon. In any event, she was born circa 1932, and was a white female with orange eyes, who had clearly gained her Championship quite early on. No siblings are currently known. Although she clearly did obtain her Championship at an early age, it remains unclear as in which association the title was originally gained. 'Snowey Manx' appears to have been a successful breeder, with three progeny listed in databases, the first two of which, a son and a daughter, were bred by Mrs. A.L. Campbell of Portland, Oregon, and subsequently sold to Conseulo L. Hanna, of Lu Verne, Iowa. These were 'Hanna's Rosamund' a white Manx female, (UCCA 2-B-669) and 'Hanna's Tobermory'. The sire of both, was Mrs. Briggs Manx, 'Bob Briggs'. Her second listed kitten was 'Hanna's Tobermory' a Manx male and a full sibling to 'Rosamund. It is interesting to note that both 'Hanna's Rosamund' and her brother 'Hanna's Tobermory' were bred together, to produce 'Briargate Boy of Ramtal'. 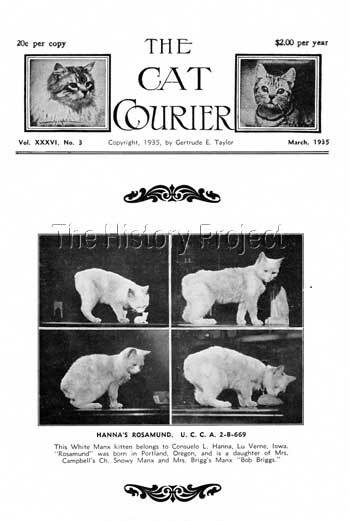 This would suggest that at some point in time, Mrs. Hanna, who was also an established breeder of White Persians, may have given up on breeding Manx, and that Mrs. Campbell may have done the same, as we find that progeny from both queens appear then to come from the newly established 'Briargate' cattery (regd in CFA, in 1935). 'Briargate' was run by Mrs. C.F. (Matil) Rotter of Minnesota, who later became a Board Member of CFA and a CFA Judge. 'Snowey Manx's' next litter, from a breeding her to her son 'Tobermory', produced 'Briargate Bunny of Ramtal', who went full circle back to 'Snowey Manx's' breeder, Mrs. Stephen L. Stillman in New York. Similarly, the aforementioned breeding, between 'Hanna's Rosamund' and 'Hanna's Tobermory' also took place at Briargate, with 'Briargate Boy of Ramtal' also finding his way to Mrs. Stillman. 'Ch.Ramtal's Snowy Manx' and her daughter 'Hanna's Rosamund'. Other quotations as per acknowledgements noted.Photos and quotations as per sources quoted.